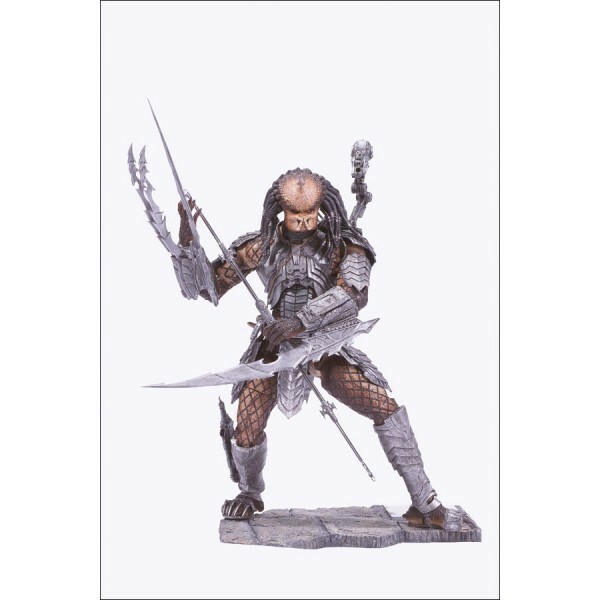 Scar Predator is 8 1/2 inches (21.6cm) tall on base with 21 points of useful articulation. Scar Predator is based directly on film reference from Alien vs. Predator. Figure is well-articulated and has a base and foot pegs. Shoulder-mounted cannon is fully posable and gun can be removed from arm. Left wrist control panel open and closes. Predator has masked head, all arm blades, separate spear and shin-mounted holster with removable knife. Trophy necklace can be removed. Height: 8 1/2 (21.6cm) inches tall on base. Articulation: Neck (ball joints), shoulders (double ball joints), elbows, wrists (left is ball-jointed), pectoral joints, chest (ball joint), waist, hips (ball joints), thighs, knees and ankles (ball joints). Total of 21 points of useful articulation. Accessories: Package includes fully detailed Scar Predator based directly on film reference from Alien vs. Predator. Figure is well-articulated and has a base and foot pegs. Shoulder-mounted cannon is fully posable and gun can be removed from arm. Left wrist control panel open and closes. Predator has masked head (note: plans call for an unmasked version, too), all arm blades, separate spear and shin-mounted holster with removable knife. Trophy necklace can be removed.